For the second time in a week a NY Supreme court judge has determined that a town does have the right to ban fracking using zoning and land use law. This afternoon Justice Donald F. Cerio upheld the town of Middlefield, NY (Otsego County) ban on fracking within town boundaries.The town board passed the new zoning law at the end of June, 2011. In September, dairy farmer and town resident Jennifer Huntington initiated a lawsuit against the town claiming that the new law is illegal and infringes on her private property rights to allow gas drilling on her land. Judge Cerio disagrees. While the state has the power to regulate how the industry operates, the town has the right to determine where that industry may - or may not - operate. You can read the judge's decision here. 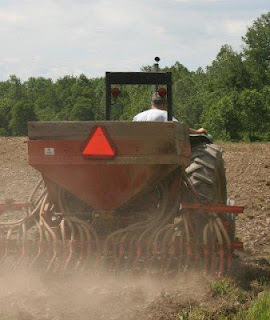 a NY farmer preparing field for beans. Yesterday the National Farmers Union in Canada called for a moratorium against fracking. Jan Slomp, a dairy farmer and coordinator for the NFU in Alberta says that many farmers in her area have either experienced problems with their water wells or have neighbors whose wells have been affected by drilling. “We are in the heart of Alberta’s oil and gas country where our ability to produce good, wholesome food is at risk of being compromised by the widespread, virtually unregulated use of this dangerous process,” Slomp told the press. Slomp also said that the Canadian Association of Petroleum Producers have acknowledged that problems exist with fracking, and have released some suggestions to prevent further problems. “However, these voluntary guidelines are no substitute for strong regulations enforced by an impartial government body,” she said. 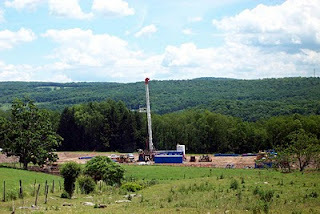 Yesterday a New York State judge ruled that the town of Dryden (Tompkins County) can ban natural gas drilling within its boundaries. State Supreme Court Judge Phillip Rumsey found that a clause in NY state oil and gas law that gives the state power to regulate drilling does not prohibit municipalities from banning gas drilling or using zoning laws to prohibit gas drilling within the town's boundaries. The Colorado-based company, Anschutz Exploration Corporation sued the town for amending their zoning regulations to ban drilling within the town limits. Anschutz has extensive leases in the town. This is only the first step. Appeals are sure to come. Tonight the Montrose Borough council will meet for the third time in as many weeks. Their first meeting, on Feb. 6 came to an abrupt halt when, after being filmed for ten minutes, they decided that anyone with objections to being recorded by video camera could walk out. They walked. Remember – that was an open meeting for conducting the public’s business. Then last week, the council members elected to represent the people, instituted a long list of ways to restrict public speech and freedom of the press. The council meeting begins at 7:30 pm in the Montrose Borough Building, 61 Cherry Street, Montrose PA.
and requiring audio recording devices to also be located behind the back row and be visible. Press reports quote ACLU staff attorney Mary Catherine Roper as characterizing the new rules as “wacky”, saying that they go too far. A good portion of time before the meeting even started council members tried to persuade a credentialed independent journalist to move her video camera to the back of the room. They finally ordered a policeman to take her camera – and this occurred before the new rules were voted on. Their reason: someone might trip over the tripod. 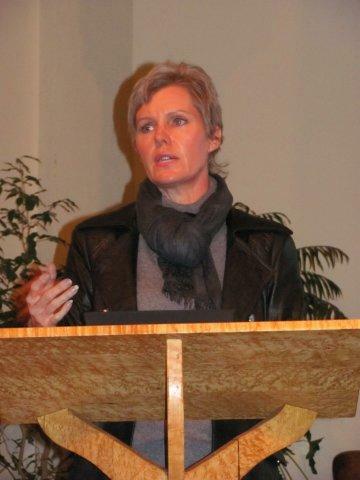 Why are the good councilors of Montrose afraid of people recording their public, open meetings? Meetings that, according to PA law anyone can attend? Meetings that, according to PA law may be recorded? Perhaps it has to do with an agenda item listed on their February 6 meeting – an item never discussed because the meeting was brought to an abrupt halt. Item number three, listed on the agenda under “Discussion Items” was “Jessup Street, water hydrant.” Nothing dramatic about that, unless you happen to know that the Pennsylvania American Water Company placed a hydrant there, on private land, and that hydrant is being used to fill a small water truck that delivers water to Dimock residents with contaminated wells, but who aren’t receiving water deliveries from the EPA. About one dozen people showed up that night to hear the council’s discussion regarding the hydrant. The above-mentioned indy journalist was present with her video camera. She started recording before the meeting started, without any comments from the council members. However, once the council meeting was convened, the supervisor advised that people who, for religious or other reasons didn’t want their images recorded, could leave the room. All but one council member left, abandoning the council chambers, the citizens they’ve sworn to represent, the PA state constitution and democracy. You can watch that video here. A few days before that, journalist and film-maker Josh Fox was forcibly removed from a public hearing in the Science, Space and Technology committee in Washington DC, and arrested – an action that many Representatives decried as shameful censorship. On Feb. 15 the US Attorney dropped the case, finding it baseless and without merit. Fox said that the incident “…serves as a painful reminder that we do not have rights unless we exercise them.” You can read his entire comment here. The research and policy center has called on state leaders to halt additional shale gas drilling until operators can demonstrate that they can extract gas in a manner that is safe for the environment and public health – “a threshold that, to date, they have not met,” says Staaf. $190,000 as part of a consent order and agreement after the operator lost control of a well head during hydraulic fracturing of the Atgas 2H Well in Leroy Township, Bradford County, on April 19, 2011. Fluids from the well mixed with rainwater and entered a nearby unnamed tributary to Towanda Creek and Towanda Creek itself. $160,000 as part of a consent order and agreement resulting from violations in 2010 of impacting a wetland and allowing sediment to enter Sugar Creek in North Towanda Township, Bradford County. Is fracking on hold in NY? Given that Governor Andrew Cuomo steered clear of the topic during his state-of-the-state address last month, it might be. When questioned by the NY Times, the governor’s office declined to answer questions. They did, however, trot out one of Cuomo’s statements from sometime last fall: that a decision about hydrofracking should be based on the facts and science. Who will review all those “facts and science”? The NYS Department of Environmental Conservation (DEC), where workers are busy scanning 61,000 comments on the SGEIS (Supplemental Generic Environmental Impact Statement) on high-volume horizontal hydraulic fracturing. At least that’s the count according to DEC Commissioner Joe Martens - and that means a lot of scanning which, say press reports, has already resulted in shoulder injuries due to the repetitive action. Scanning is just the first step. Martens told the AP that “considerable work” needs to be done on the regulations, and he’s assigned 50 staff members to review and respond to those comments. In the meantime it looks like even the most outspoken pro-drilling advocates are advising patience. Take Tom Libous, the second-ranking Republican in the NY State Senate, who represents counties in the Southern Tier. Counties sitting right on top of Marcellus shale and a handful of other gas-rich formations. Counties where landowner groups are sending members to Texas to negotiate lucrative leases. Libous recently told the NY Times that the state may not rush to approve hydrofracking permits. Over-exuberance about the promise of shale gas is overshadowing the falling profitability and declining productivity of shale gas wells. That’s the message Deborah Rogers is bringing to communities scattered across the Marcellus shale region, and she should know – she’s been analyzing productivity of Barnett shale gas wells around her home in Fort Worth, TX. Rogers, a former stockbroker for Merrill Lynch, has served on the Advisory Council for the Federal Reserve Bank of Dallas since 2008. She became concerned when the numbers didn’t add up: estimates of reserves didn’t match the actual production-generated tax revenues that Fort Worth and neighboring municipal governments received. When she started digging into the data she learned that less than six percent of Barnett shale wells met “minimum economic thresholds”. The industry claims that natural gas offers a cheap and abundant energy source that will last 100 years. But data from the Barnett shale gas play show a well failure rate that is increasing over time, says Rogers. Even as companies drill more wells, the amount of gas produced has been declining. She points to audited records from the City of Fort Worth: in 2008 the city took in $50 million in income from wells drilled on city-owned properties. By 2010 the income was $38 million – based on four times as many wells. 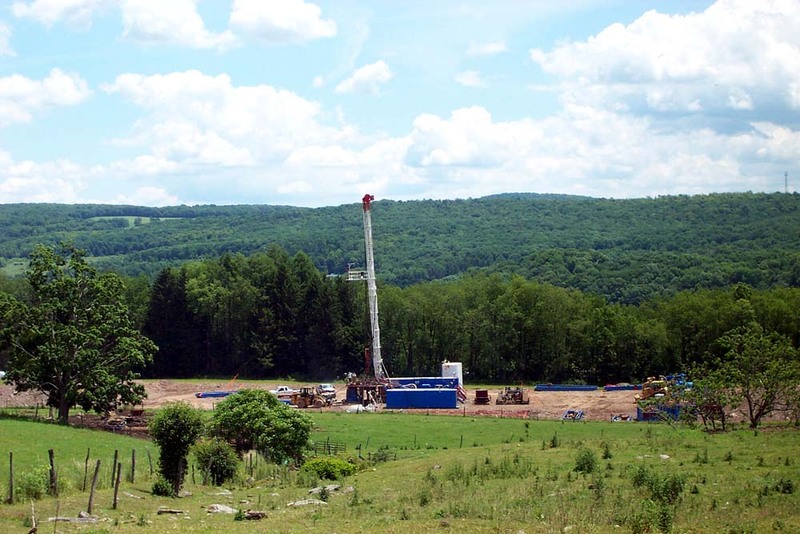 Geologists are finding shale gas reserves to be less homogeneous than once thought. Unfortunately, all those wells bring heavy environmental and health costs to the communities. Air quality data collected by the Texas Commission for Environmental Quality (TCEQ) show high levels of two carcinogens, benzene and formaldehyde. Air tests also measured hydrogen sulfide, a potent neurotoxin, at levels 400 times what is usually found in urban air. TCEQ’s conclusion: gas drilling “contributes more air toxins than all cars, trucks and airplanes in the region combined,” says Rogers. The gas industry continues to promote the conversion of vehicles and power plants to natural gas, claiming this domestic source of energy will result in a cleaner environment. At the same time they are quietly pursuing an export market, seeking permits to convert import terminals to expert terminals. This is happening just as American companies are looking to bring production back home, says Rogers. The promise of cheaper energy costs has car manufacturers ramping up production of gas-powered vehicles and other manufacturers bringing their factories back to the US. But, hey – if you don’t believe her analysis you just have to look at the recent news from the US Energy Information Administration (EIA). On January 23 the agencylowered its estimates of recoverable shale gas reserves in the US and slashed their estimate of Marcellus reserves by 66 percent. That same day Chesapeake announced that they are cutting drilling andproduction of gas – due to low prices. You can read more about what Rogers said here.